The LP103W is a general purpose 10 channel mixed signal logic probe compatible with all BitScopes. It is a good choice for non-SMT mixed signal work and is supplied with a set of 10 mini-hook test clips providing robust connectivity to thru-hole components, wires and test points. This voltage must not be exceeded at the POD input connector. Direct connection voltage ranges. These may be increased with series resistor. For example, a 100K series resistor will double the voltage range and switching points. A 5V power supply rail is provided at the POD connector. An optional 9V or 12V supply may also be available (depends on BitScope model to which it is connected). These may be used to supply low powered external circuits to which LP103W is connected. 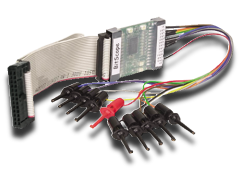 The POD connector includes LEDs to indicate power availability and logic level on the first logic channel (independently of BitScope).